During the Civil War, Kentucky was a valued border state, which meant though both Union & Confederates wanted it (partially due to its resources & strategic geographic location), it declared loyalties to neither - in theory, of course. In practice, the official state government flew a Union flag over Frankfort's Capitol Building. 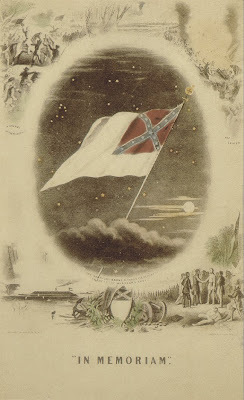 However, the Confederacy also accepted the ordinance of secession from a convention representing 64 counties, and, on December 12, 1861, Kentucky became the 13th - and, purportedly, the center star on the Confederate flag. A version of the Confederate flag is pictured above. Kentucky's Confederate government was never more than a provisional government; formed quickly and readily mobile, until a permanent, stable one could be established. As with much of history, it is arguable when this process truly began, but secessionists and southern delegates first met to discuss joining the Confederacy in October 1861. The following month, a sovereignty convention, chaired by John C. Breckinridge, met in Russellville for 3 days. This time, the shadow government formed adopting the 1850 Kentucky Constitution, a capital (Bowling Green, though they conceded to meet anywhere, for realistic purposes), a Governor (George W. Johnson), and a 10-member council, with judges and other officials, as necessary. Their first act was to secede from the Union. Though it was through irregular procedure, Confederate President Jefferson Davis, a native Kentuckian, had reccommended their admittance when he first heard of their meeting - and accepted! Success of Kentucky's Confederate government was not to be, however. Union forces had a general stronghold on the state, meaning the mobile government stayed behind the Confederate lines, which changed greatly throughout the constant Kentucky battling over the following year. The Confederacy required militia quotas from each state, which they were never able to fulfill. Even Confederate KY's first Governor volunteered, only to die at the Battle of Shiloh. His replacement was Richard Hawes. Despite seizing area banks, Confederate KY was never able to pay the required taxes either. Nevertheless, they attempted to establish their permanent government with an inauguration at an occupied Frankfort in October 1862. This again, failed, leading to the Battle of Perryville. For the remainder of the war, Confederates (with the exception of raiders) never officially saw their home state. The shadow government only existed on paper and with the Senators and Representatives in the Confederate Congress. When the Confederacy disappeared, so did Confederate Kentucky. The image above commemorates the Confederacy, its flag, and the efforts of those who seceded from the United States of America. But is it in a proud manner or is it satire? What do you think?